While the criteria used to determine flagship status will vary from state to state, typically a state’s flagship is its land-grant institution. It is likely to be the university with the highest research profile and the most doctoral programs. It may house the state’s medical school, law school, or both. And it may be the largest and best endowed university in the state. Membership in the prestigious Association of American Universities may be yet another factor, and NCAA Division I athletics is a must. The claim that the only “must” in the definition is NCAA Division 1 athletics may be more revealing about the value of flagship status then intended. 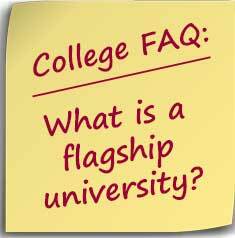 Depending on the definition, the flagship doesn’t have to be just one university. In Texas, both the University of Texas and Texas A&M are consider flagship universities and there is a push to elevate more universities to “flagship” status. However, the College Board appears to only recognize one flagship per state and in Texas that’s the University of Texas. While there generally isn’t any official designation, there has been at least one case of official “undesignation.” The Idaho State Board of Education removed the word “flagship” as part of the University of Idaho’s mission because members felt it was unfair to other state universities. For more information on the politics of the term flagship university, see The Future of Flagship Universities and the Wikipedia talk on Flagship University.